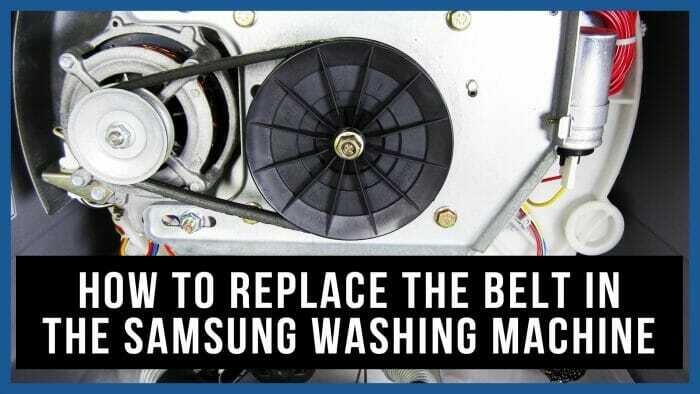 Replacement of the belt in a Samsung washing machine is a repair of medium complexity, which can be done by advanced beginners. Abnormal noise or rumble is heard when washing. When inspecting the surface, the part is rough (similar to dirt), it rolls in case of friction. You have been using the machine for more than 6 years – usually this is the life of the part. If at least one of the above reasons is confirmed, you need to carry out a technical inspection of the machine – you may need to replace the part. Buy an original part. Rewrite the marking (printed on the product itself) or take the old belt with you to the store. Take the usual electrical tape – you will need no more than 15 cm. Pick a wire with a diameter of 0.5 to 0.8 mm and a length of 50 cm. Take a flashlight, wire cutters, a “minus” and a “plus” screwdriver. Remove the back panel by unscrewing the fasteners. In models that do not have a removable back panel, you need to remove the front part. Works in this case are conducted from above. Remove the powder dispenser (there is a small button inside for easy removal). Remove the control panel and place it on top so as it didn’t interfere. Unscrew all screws that secure the front cover and pull it towards you. Take a slotted screwdriver – gently hook the edge of the belt with its help. Remove the belt from the grooves on the pulley, sliding it to the side. Roll the pulley, holding the strap with your hand. After that, the belt should easily get off the pulley and it can be safely removed from the case. Important! If there is a “backlash”, and it wound up on the drive, be sure to unravel everything and remove it. Put the new part on the pulley, so that the grooves laid down as provided by the manufacturer. If you carry out repair from the top of the Samsung washing machine, then help yourself with a strong thread or a piece of a used belt. Tie the belt with an improvised “fishing rod” and lower it into the case. Hold it with one hand and put it on the drive with the other one. Now stretch and place the part on the side furrows on the pulley. Continuing stretching, roll the pulley to the right, and everything will fall into place.